The entry-level Schwinn 820p treadmill came out in 2005 and was once considered a good design. 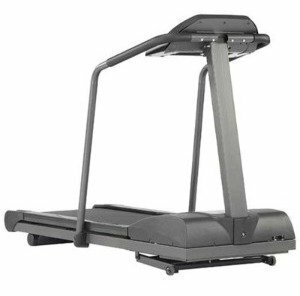 But 2005 is ancient history in treadmill innovation time and this one can’t compare to the better quality that $799 will buy you these days. The multi-color LED and scrolling dot matrix display shows time, speed, distance, incline, calories, heart rate, race track, and results mode. The workout programs include beginning walker, rolling hills, interval speed, hill intervals, hill repeats, user-defined, and heart rate programs. UPDATE: The Schwinn 820P is no longer available. You can check out the most popular current models on sale here. The Schwinn 820p offers basic features of 10 pre-set workouts, 10 mph maximum speed, a 15% max incline level, large 2.5" rollers, a two-ply belt, and a 2.0 hp continuous duty motor (5.1 peak horsepower). While all those specs sound like they would add up to a decent treadmill, the quality control is so bad on Schwinn treadmills that the design is the only standout. Although the Schwinn 820p was listed as a Best Buy years ago by a leading consumer magazine, reviewers do not have the same high opinion of it. Some of the problems: not a solid frame and a very shaky console even at low speeds, heart rate monitor readings are inaccurate, during assembly the railing screw holes do not line up with the holes on the frame ... and other quality control issues. Schwinn Fitness excels at making great exercise bikes, and does a good job with entry-level ellipticals, but the company should give up on its treadmill models. There are competing manufacturers selling treadmills at this price level that leave Schwinn standing at the starting gate. The Schwinn 820p treadmill is a waste of money at any price. 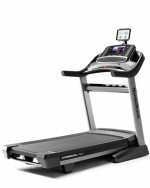 It is a walker’s treadmill with below average cushioning on the deck, an underpowered motor, a low max user weight of just 275 pounds, and a host of other issues. We hope that you are reading this review before you click on the buy button for this discontinued model – Schwinn has stopped producing it for a reason.